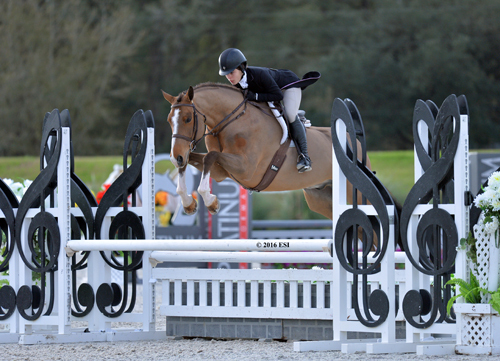 Ocala, FL (February 10, 2016): The $5,000 Devoucoux Hunter Prix and the $1,500 Platinum Performance Hunter Prix resumed a weekend packed with big opportunities for horses and riders at HITS Post Time Farm. A talented field of thirty-three tested the course to vie for the blue as well as a prestigious qualifying opportunity for the $500,000 Diamond Mills Hunter Prix at the HITS Championship in September 2016. In the $5,000 Devoucoux Hunter Prix on Saturday, the top twelve returned for the second round to prove who was the ultimate in finesse and style. The top three riders scores reversed from the first round to the second, making for interesting final placings. The team to beat was Daniel Geitner of Aiken, South Carolina, and Sky Pilot, owned by Allison Mills. They earned a first round score of 85.50, improving to an 86.75 to take home the win in the two-round classic with a total score of 172.25. Geitner began in third after the first round, then moved to the lead in the second round. Second-Place was awarded to Amanda Steege from Bedminster, New Jersey, and Loxley, owned by Finale Partners, LLC. They rode to achieve a first round score of 86, to advance the second round. A second round score of 86.125 put them just behind Geitner for with a total of 172.125. Steege remained in second in the second round. The equestrian also garnered fourth-place on Zidane, owned by Susan Darragh. Elementary, owned by Fleur De Lis Farms, and Hunter Holloway of Topeka, Kansas, earned third-place. Their efforts earned them a first round score of 87, the highest score of round one. A second round score of 85.1 brought the total to 172.10 behind Steege by just a fraction of a point. Holloway began the class in the lead and rounded out in third by the second round. The top five concluded with Harold Chopping of Southern, Pines, North Carolina, and Caramo, owned by Caroline Russell Howe. The winning title belonged to Alexandra Rainis of Long Valley, New Jersey, and So What, owned by Arklys, LLC, in the $1,500 Platinum Performance Hunter Prix on Saturday, which also serves as a qualifying opportunity for the $250,000 Platinum Performance Hunter Prix Final at the HITS Championship in September 2016. They made a tremendous comeback from a first-round score of 78 to a second-round score of 87, to take home the victory in the two-round classic with a total score of 165. Second-place went to Herrold, owned and ridden by Mindy Whitman. The equestrian of Marstons Mills, Massachusetts, and her mount earned the highest score of the first-round, an 83, and a second round score of 81.5 for a total of 164.5. Jacquelyn Maggiore of South Boston, Massachusetts, and her own Contina, earned a first-round score of 79, improving to an 85 for a total of 164 to take third-place. out with Jess Lusty of York, Maine, and Anucci.